Baseball Batting Drills address the mechanical part of hitting, but there is another aspect other than physical which plays a Huge part in hitting, and that‘s the Mental portion, of which Confidence plays a major role. Let me show you One such drill which has proven extremely effective as a confidence builder,and I used successfully in batting practice, simply called "Little Ball". People from Kids to adults play baseball, so naturally Baseballs are produced in various sizes, also quality but that’s not our issue now, for different age and sized hands. 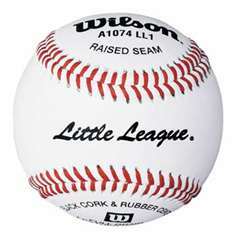 Depending on your location or league association, baseball sizes begin at Atom balls, then increase to Bantams, Midgets and finally Juvenile and Junior age brackets which use standard sized baseballs. 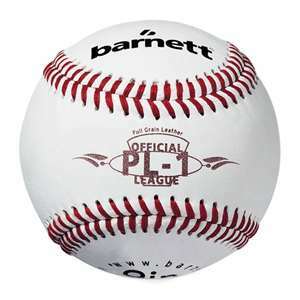 Baseball sizes can be identified by letters and / or numbers, stamped on the baseball, but there are variations of identification by manufacturers, so be careful and verify you are getting the correct sized baseballs. There are Two requirements for this drill and if unable to fulfill either one, I do not suggest performing the drill as there's a possibility you’ll create more harm than good. (1.) The correct 1 size down baseball must be available and used …. **** Obtain a case of baseballs, a dozen in a case, from your association or purchase a case from any reputable sporting goods store in the area. 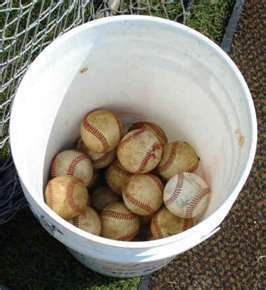 The sporting goods stores in the area will carry the identical baseballs your league uses so there's no problem obtaining replacement balls to the league or individual teams. (a.) I caution using inferior baseballs from Walmart because the feel and reaction of these balls are ... at best sparodic. The drill is intended to increase confidence, not create confusion of why the ball did silly twirls in the dirt when hit. (b.) Insure the Baseballs are ONE size down from your team’s level, which a Sporting Goods Store can easily verify, if you’re a Midget team, buy Bantam baseballs, Juniors buys Midget sized baseballs. (c.) The Intent of this drill is quite simple, to have your batters attempting to hit a smaller baseball than they normally try to hit in competition. We’re not talking Rocket Science, as the benefits of a successful batting practice utilizing this drill are immediate and easily seen. (1.) Mental Concentration and Visual Focus are magnified by following a smaller target and this provides the illusion, whether real or perceived, in which in comparison to the smaller baseball, the standard sized ball appears to become a much larger target to see and much easier to hit. (2.) Success Breeds Confidence and achieving Good results in batting practice, you notice I didn't say great, but good, hitting an undersized target builds confidence in the player of being able to make hard contact with a bigger target. (3.) You’re placing your players into a “No Lose” situation, as should they merely foul the pitches, they have made contact with a smaller target and the assumption that those foul balls would have been solid hits with the larger baseball is quite valid, although possibly not entirely accurate. In the event you’re unable to acquire baseballs 1 size smaller, I caution to not perform the drill, as using baseballs too small makes the task of hitting them nearly too difficult and you may destroy what confidence a player had, backfiring on you. As a batter will gain confidence from hitting a smaller target, so too will fielders. (a.) Go through your normal infield and outfield fielding drills with the Exception of the throwing the ball hard, such as when completing a double play or a long throw from the outfield. (b.) The ability to cleanly field or track down a high fly ball from a smaller target will instill another level of confidence in your players, and remember offensive success breeds defensive success and visa versa. You can attempt this drill using a baseball, but I don’t recommend it because the ball will not bounce constantly, nor as high as required for the drill, I’d suggest using a rubber or racquetball. (a.) The Coach, from whatever location works best for his control, but the closer the better, lobs the ball underhanded in an arc, bouncing the ball 3 to 4 feet in front of the plate. (b.) The hitter watches the ball from the coach’s hand, through the bounce and hits the ball as it bounces over the plate. This forced hesitation of watching the ball’s flight, then bounce before being allowed to swing helps the hitter be patient. (a.) The Coach from the same location, lobs the ball in a higher arc, as if it were slow pitch softball. (b.) The hitter will be instructed to wait until he can get a level swing and attempt to drive the ball up the middle. This drill magnifies concentration and hand to eye coordination. If you think hitting a slow pitch softball with a baseball type swing is easy …well, try it and don’t hit dribbling ground balls to the infield. Learning Hesitation is essential for keeping the weight and hands back when batting against breaking ball pitchers.